In this episode of SIDHA KURA JANATA SANGA is raising the topics of a traffic post is following a women where burn by the cigarette, giving the receipt and taking out air pressure of tires. 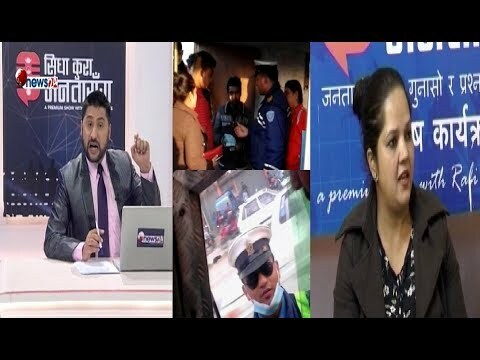 A popular Tv Show of SIDHA KURA JANATA SANGA is broadcasting in News24TV nepal by the presenter Rabi Lamichhane. The Program SIDHA KURA JANATA SANGA where public issues and theirs problems are raised for the positive solution. Election department and its complications also can watch in this episode. SIDHA KURA JANATA SANGA is rescuing a sad story and Jhapa Police are associating for the prostitute issues and its solutions. watch Much more Public issues in the episode Below.